Many marketers understands the idea of “first choice”; that if your product is chosen once, your chance of being selected again greatly increases. This idea is about how that choice works and how you can improve choice architecture to gain a higher likelihood of first choice and subsequent choices, ultimately resulting in higher sales. Research has found that consumer decisions can be highly sensitive to situational factors, even when those factors are unrelated to the actual utility of the decision. This indicates that seemingly unrelated factors can affect your customers decisions towards or against your product. What studies surprisingly found is that people are unaware of these underlying factors and misattribute the behavior caused by these factors to a stable underlying preference. Subsequently, choosing a product transforms from an indication that they actually prefer the product over another, to instead establishing itself as a self-defined preference through being chosen in the first place. What happens is that your mind plays tricks on you by saying that since you made this decision in the past, this is a good decision to make in the future even if it could be for all the “wrong” (situational factors) reasons when presented as a choice again. From a psychological point of view actions can create, rather than reflect, preferences. This has been shown in studies of both short term and longer term decisions. Actions taken due to transient situational factors have a great impact on your future decision making, however it turns out people can not even remember the “actual” value of a decision without the bias of these situational factors, which complicates the process further. To see an example of a situational factor, we can look at one study which explored the relationship between rates of a university’s applications (often believed to reflect preferences) and the weather on the the day when potential applicants visited the university. Students visiting the campus on a cloudy day tended to apply more frequently to college (projection bias); in this case weather acted as a situational factor that, while seemingly unrelated to the actual value of the education provided at the university, influenced the application rates. Situational factors can be anything that affects the situation in some way and can sway the individual towards or away from a choice. If a decision as important as the university you choose can be affected by situational factors like the weather, it is quite probable that these factors also can affect other decisions far less important in people’s lives. In addition to this the first, situationally influenced, decision has a knock-on effect on people’s beliefs about their preference and subsequent decision making. These factors are difficult to control for in empirical research and since it is a novel field of science it would benefit from more field experiments. In order to gain an understanding of which situational factors effects your product or service I would first try to map out the buying context of your brand. What is the setting your product is in? What emotional state is your consumer in when making the decision to buy? You might have an idea of this already, but this could and should be done by focusing on the user, with interviews, observations and most importantly interpretations and qualitative analysis in order to gain a robust understanding of the context. Here it is of importance to both listen to the objective (what actually happens) and the subjective experience (observations and interpretations) since, as described earlier, people often misattribute value to something other than situational factors that can strongly affect their decision. Once you get an understanding of the context and key situational factors you may be able to identify new factors that could affect the decision positively towards your product or service. With more knowledge you are able to incorporate such factors yourself, for instance the framing effect or the IKEA effect, as I have previously described on The Choice Architect. The purchase decision may then not be as directly related to the value (utility) of your product or service as you might have thought in the past, however it is still very valuable for your product to be selected when it is first presented as a choice (in addition there is still the lock-in effect). The first choice is crucial, and developing an awareness of the impact of situational factors and their effects on your consumers’ decisions should encourage humbleness in any sales and marketing department and a drive towards continuously developing your offerings. So directing efforts into mapping the unknown situational factors and trying to shift them towards a purchasing decision for your product can be very valuable in order to change your customers preferences to choosing you, not only the first time but subsequently in future decisions. 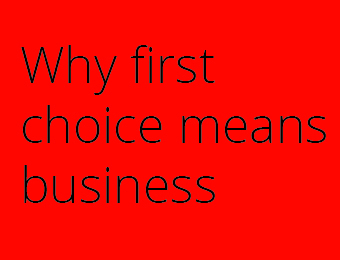 By utilizing the concepts of this article you could gain a better understanding of how first choice leads to business and why it is of great importance for your products and services. This idea can empower you to take more informed decisions on where to direct your sales and marketing efforts in the future. The first decision, even how irrational the factor it is based on it may seem, still significantly impacts the consumers’ future purchasing decisions and ultimately can affect whether your product or service becomes a success or a failure. How actions create, not just reveal, preferences. Ariely D, Norton MI Trends Cogn Sci. 2008 Jan; 12(1):13-6.